Tessie Kinnikin thought she'd be spending Mother's Day alone. One son was at college in California. 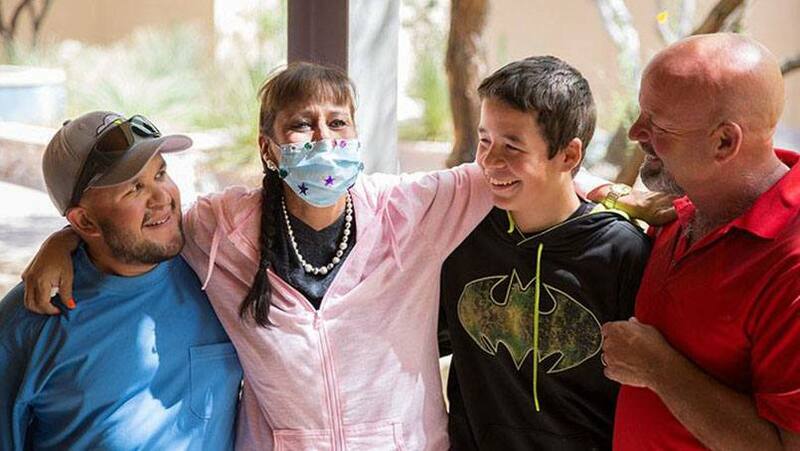 Her two other sons and her husband were back home in New Mexico — a seven-hour drive from the Village at Mayo Clinic, where Tessie was recovering after a liver transplant at Mayo's Arizona campus. And while her digs were "so comfortable and homey" she says her stay "honestly felt like a vacation," that didn't keep Tessie from missing her boys. "I hadn't seen my youngest son in three weeks," she says. "I'd never been away from my family that long." Tessie's husband, Clay, knew the separation was difficult for his wife. So as Mother's Day approached, he and two of his sons decided to drive to Arizona to surprise her. The problem: "She's pretty snoopy," Clay says with a laugh. "And she calls a lot." That made for some creative conversations during the road trip. "We kept thinking of ways to throw her off her game," Clay says. Their plan worked. And when the trio walked into the Brusally Center at the Village at Mayo Clinic, Tessie's surprise and joy were clear to everyone in the room — including the photographer who captured the emotional scene. We were so moved by the images that we had to learn the story behind the photos. "I honestly don't have words to describe what it was like to see them," Tessie tells us. "It was priceless. God's timing is amazing." She also credits "amazing timing" for her relatively short wait for a transplant. Just eight weeks after being listed for transplant, Tessie received a new liver. Also amazing? Her care at Mayo Clinic. "They managed my care the way they would have for their own family members," Tessie says. "That's how invested I felt they were in me." When we spoke with Tessie, she was just days away from leaving Mayo and heading back home. "Most of me is ready to go," Tessie told us in a voice choked with emotion, "but I will miss this place and these people. We've made lifelong friends here. Leaving is going to be bittersweet." It would be more sweet than bitter if you'd leave a comment below. Then, you can use the social media tools to share this story with others. We had similar feelings when we left Jacksonville after my husband’s liver transplant in 2013. 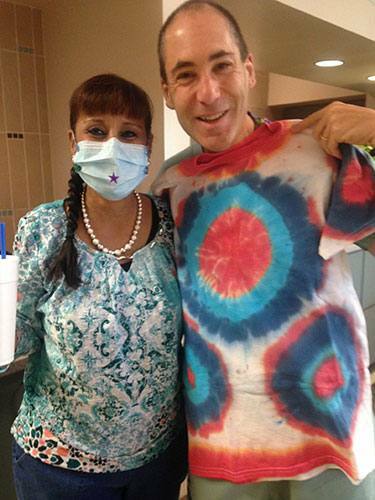 The bond that is formed between the staff and patients, and their familiy, is like no other. We relocated to JAX for 4 months prior to transplant, and then 2 months after transplant. We could have returned home sooner, but like you, we had mixed emotions about leaving our new family. As Tessie’s care-giver for 2 weeks, words alone will never be enough to describe the joy our Mayo experience brought our family. Dr. Singer, the medical staff, healing house staff, etc etc etc were incredibly awesome and cared for my sister as if she had been their own family member. Thank you to the media staff whose perfect timing managed to capture not only the surprise visit, but gave Tessie an opportunity to share with others her gratitude for the attention and care she received by so many at the Mayo. Blessings to ALL of you!